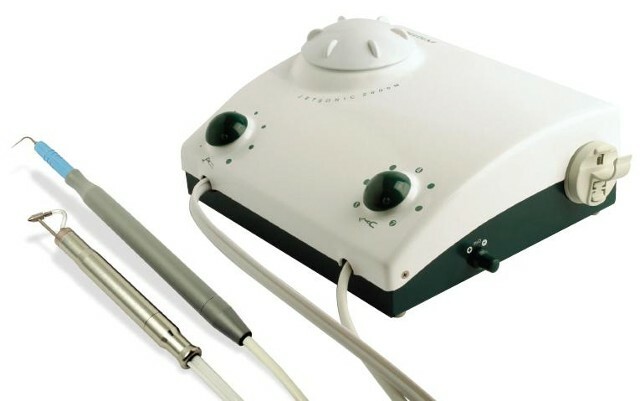 Finally, it’s all here: the first ultrasonic scaler/airpolisher that accepts BOTH 25K and 30K inserts. Other manufacturers sell 25/30K scalers without polisher combinations, or combination scaler/polishers that only accept 30K inserts, but DELDENT has it all, for economy, convenience and time saved. This hardworking combo unit runs on sensor technology and has the ability to “read” what the user is doing when the desired handpiece is removed from its holder with no manual switching. The POWER SURGE MODE™ footswitch revs up the power without having to stop in either mode. And at about $1,000 less than similar brand models, DELDENT provides more technology for less. Double Click the Foot pedal switch increases power for removal of tenacious Deposits. Automatically Tunes either 25Khz or 30Khz scaling inserts. Provides the highest assurance against cross-contamination by autoclaving your handpieces.